Regarding the topic of followership and technology, particularly in the realm of social media there seems to be a gap in the literature that should be resolved as it pertains to participation, technology, followership and public administration. A steady stream of literature has been created over the course of the last few years with search results climbing for in leadership and technology, social media and participation, and social media and leadership; however, followership and technology or social media has seemingly been left in the dust with the exception of a handful of organizational communication articles mostly addressing participation in an office or social environment. The closest dynamics addressed in the literature specifically to followership and public administration were that of followership at a distance and also the concept of “social swarming” which David Faggard (2013) describes the working definition as “employing the full computing power of mobile technology with real-time network updates to strategically organize e-citizen forces to overwhelm an opposing force online achieving one’s own political ends (p. 80). Originally coined in 1993 as part of a series on “cyberwar” by attempting to elaborate authors John Arquilla and David Ronfeldt for RAND and the National Defense Research Institute and primarily written to aid ideas about how the information revolution affects the entire spectrum of conflict, one can’t help but see how “the nature of conflict” and swarming as a tactic have very close if not overlapping ties with participation and followership, two constructs of the public administration’s theoretical base. This doctrinal proposal relates to our efforts to flesh out a four-part vision of how to prepare for information-age conflict (Arquilla and Ronfeldt, 1997). We have argued, first of all, for adopting a broad concept of “information”—so that it is defined as something that refers not only to communications media and the messages transmitted, but also to the increasingly material “information content” of all things, including weapons and other sorts of systems. The next part of our vision focused on the organizational dimension, emphasizing that the information revolution empowers the network form—undermining most hierarchies. Moving on to the third part, we then exposited our ideas about developing an American grand strategy based on “guarded openness”—a principle that, for example, encourages reaching out widely with ideas about freedom and progress, while still being circumspect about diffusion of advanced information processes and technologies. In this document, we complete our four-part vision by articulating a doctrine we call “swarming,” and which we believe may eventually apply across the entire spectrum of conflict—from low to high intensity, and from civic-oriented actions to military combat operations on land, at sea, and in the air (preface, iii). Distance shapes the degree in how and to what degree we can and do interact with others; at the most complex level, changing notions of distance are literally morphing our relationships and spheres of influence at a rapidly changing pace. Technology renders some separations of time and space less meaningful, as we analyze the details of fallen dictatorships and changing governments from locations across the globe. Paradoxically, technology modifies and enhances other types of distance as parents and managers alike bemoan their waning influence on followers who increasingly turn to smartphones and social media, rather than their immediate leaders for daily guidance (p. 1-2). Social swarming is more than using the Internet or social media; it entails network envelopment of the information aspect of modern command and control. These complex networks are optimal when fully connected and ﬂat with opportunity for direct “horizontal communication” between network peers (Schmidtchen, 2006) and as I would also point out, leaders inspire social action or other participatory behavior. 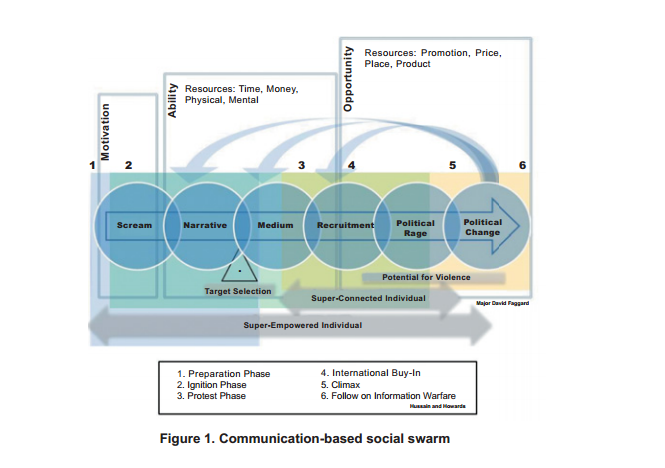 As Faggard concludes his 2013 paper [diagram], “the process of forming online groups capable of creating tension to overwhelm decision makers or government forces through a communication-based social swarm is possible. Government decision makers should take these swarms and their access to democratized digital technologies into account in future planning scenarios” (p. 87). Based upon the obvious leader-follower scenarios that each occurrence or swarm presents, participation is of core necessity to achieve a swarm level, Foursquare, the technology location check-in app, has captured this down to the very language used. Even more impressive this concept is performed remotely and in conjunction with multiple layers of leader-follower interactions in order to at attain swarm status. Shouldn’t we also be interested in owning or sharing this phenomenon as a public administration concept? Arquilla, John, and David Ronfeldt, eds., (2007) In Athena’s Camp: Preparing for Conflict in the Information Age, Santa Monica: RAND. Arquilla, John and Ronfeldt, David. (2005). Swarming and the Future of Conflict. Retrieved from http://www.rand.org/content/dam/rand/pubs/documented_briefings/2005/RAND_DB311.pdf. Bligh, Michelle and Riggio, Ronald E. Eds. (2013). Exploring distance in leader-follower relationships: when near is far and far is near. New York, NY: Taylor Francis. Faggard, D. (2013). SOCIAL SWARMING: Asymmetric effects on public discourse in future conflict. Military Review, 93(2), 79-88. Retrieved from http://search.proquest.com.ezproxy.gvsu.edu/docview/1348588653?accountid=39473. Mergel, Ines and Greeves, Bill (2013). Social media in the public sector field guide: Designing and implementing strategies and policies. San Francisco, CA:Jossey Bass. Schmidtchen, David. (2006) “Military Systems as Socio-Technical Networks,” in The Rise of the Strategic Private, Technology, Control and Change in a Network-Enabled Military, The General Sir Brudenell White Series. Commonwealth of Australia: National Library of Australia. Schulz, Suzanne M. (2013). In Search of the Secret Public Participation Recipe: Commentary. Public Administration Review, 73 (1), p. 34. Excellent blog – thought provoking. I found it to be applicable across many fields. Thanks for taking the time to comment and more importantly the work you have done.